Does Sunscreen Trigger Acne- Facts Revealed! Sunscreens have been our saviors through the ages. It has shielded our skin from the harmful Ultraviolet rays of the sun. However recent studies have revealed that your sunscreens could actually give you acne breakouts! Yes, you heard it right, in the effort of protecting your skin from sun; you may be exposing your skin to unwanted acne attack. Let’s know the facts and the solution to this issue. A good sunscreen will help you deal with sunburn however finding the right kind of sunscreen is the key. The reason behind getting acne through sunscreen is because of the fact that some sunscreen contains ingredients that can trigger breakouts. The sad part is that all active sunscreen ingredients, whether pure minerals or synthetics do cause acne. Apart from that the ingredients in a sunscreen which blends the active ingredients together can be tricky for blemish-prone skin. Clogs the pores: Sunblock’s usually contain either zinc or titanium dioxide in them, which helps to block the harmful rays of the sun. When it is applied on the skin, it forms a protective layer on the skin in order to prevent the damage from the sun rays. During this it also clogs the pores which cause acne. During summer you usually sweat a lot and the SPF that you apply traps the sweat and bacteria on the surface of the skin which results in breakouts. Avoid creamy textured products: Not only sunscreen in particular, but any cosmetic that claims to have SPF in it can cause breakouts. So avoid products that has creamy, thick textures or any other product that comes in stick form. This is because the ingredients used in the cosmetic or any skin care products that have thick texture are likely to clog the pores which will cause acne. Lotions, light serums, gels, liquids etc. are products that are less likely to clog the pores or cause breakouts. Use gel based sunscreen: Avoid using products that contain irritants of any kind like menthol, peppermint, camphor, grapefruit, and lime, synthetic as well as natural fragrances. Sunscreen in gel form is the best sunscreen formulation to use. Gel dries more quickly and does not bleed easily. As the gel sunscreen dries quickly they will not trigger breakouts easily too. Also Read – Sunblock Vs Sunscreen, Which Would Be Your Pick This Summer? Ask your dermatologist: The dermatologist will test your skin and prescribe a sunscreen that is apt for your skin. 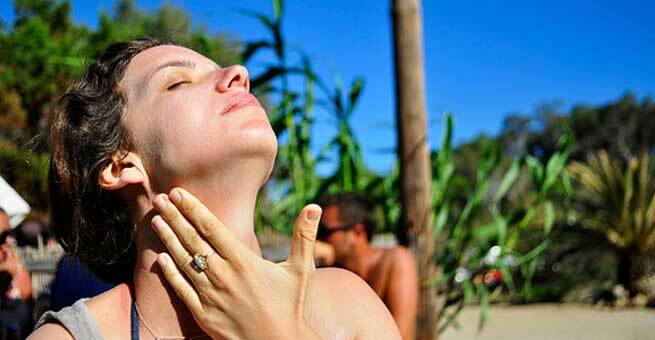 Avoid sunscreens: If it is possible, avoid sunscreen completely especially if you have an acne prone skin. Experiment with the sunscreen: If you have had breakouts after using certain brand of sunscreen then try using another brand until you find the one that suits you or does not cause acne on your skin. Check the ingredients: When you go for sunscreen shopping, always make it a point to check the ingredients before you buy them. Never buy oil based sunscreen if you have an acne prone skin. Take care of your skin: Applying sunscreen does not mean your skin is safeguarded forever! Once you are done with your day, make sure you remove the sunscreen completely off your face. Cleanse your skin thoroughly before you go to sleep. This step has to be followed religiously to ensure all the bacteria and germs are eliminated from your skin. Reapply the sunscreen: Every sunscreen has a lasting time. If you are in the sun for a long time, then it is advised that you reapply the sunscreen after 3 to 4 hours. This will ensure you get proper protection and keep your skin safe from the dirt and bacteria too. Know your SPF: In order to protect healthy skin from UV radiation, a sunscreen with an SPF 30 is more than enough. This applies for sensitive skins too. There is no need to give an SPF overdose to your skin. Also Read – Sunscreen Facts Decoded – Which sunscreen is best for you ?